an alphabet system for the blind, consisting of raised dots that can be felt with the fingertip. Braille alphabet based on six-dot system. From Stein et al., 2000. A system of writing and printing by means of raised dots corresponding to letters, numbers, and punctuation to enable the blind to read by touch. a system of printing for the blind consisting of raised dots or points that can be read by touch. Alphanumeric writing designed for the vision impaired; characters are encoded and typed in relief, so properly trained fingers can “read” written communication. Public health Alphanumeric writing designed for the vision impaired; characters are encoded and typed in relief so properly trained fingers can “read” written communication. Cf Americans with Disabilities Act, Service dog. A method of coding information using groups of six raised spots embossed on paper, to enable the blind to read through touch. (Louis Braille, 1809–1852, French school teacher). Braille - system of raised dots placed in patterns to allow the blind to read. Braillophone - a combination telephone and braille system. System of printing for blind persons, consisting of points raised above the surface of the paper used as symbols to indicate the letters of the alphabet. Reading is accomplished by touching the points with the fingertips. n.pr a printing and writing system using elevated dots to represent letters. The system allows those individuals with limited or no visual ability to read via touch. However, because the braille alphabet also must represent numbers, punctuation, capitalization, and so on, it needs more than twenty-six symbols. Have the investigators study the braille alphabet on the reproducible page. Use of the large manipulatable braille cell during classes gave participants a jump start on learning the braille alphabet, while the hands-on demonstration of writing braille dispelled the mysteries related to the practicality of braille. Most participants stated they knew at least the braille alphabet and some contractions (n = 9, 29. The classroom library includes print-braille books for all to read, a poster of the braille alphabet (enlarged by a local printing shop) hanging on the wall, and a tactile braille alphabet card below the poster inviting fingers to touch. 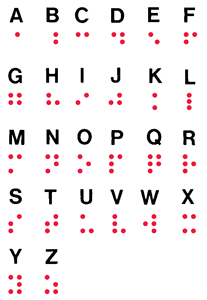 Several of the activities described next refer to braille alphabet charts from The Braille Trail (Swenson & D'Andrea, 2002), an activity book for sighted children in grades 2-6. It is a reflection of Louis Braille's genius that his simple, versatile braille alphabet is used in our technological era, remaining virtually unchanged. Meanwhile, Cara was learning to identify and discriminate some braille alphabet letters tactually. For example, children who will be braille readers have significantly fewer opportunities for incidental interactions with braille and fewer direct experiences in learning the braille alphabet than do children who are sighted with print and the print alphabet. We investigated dots in the form of Braille alphabets, Morse code, splatter painting by Jackson Pollock and pointillism by Seurat and Lichtenstein. In its effort to facilitate what it called "the great Braille revival that is sweeping over the continent," the library offered its members British Braille alphabets and primers free of charge.